What Is The L-Glutamine Amino Acid and Is It Vegan? Glutamine is another one of those common bodybuilding supplement buzzwords, but it may not live up to the hype. Also known as l-glutamine, this amino acid is a commonly used supplement for bodybuilders and other athletes. Find out what glutamine is, why it’s important for vegan bodybuilders, and how to add it to your diet without sacrificing your commitment to a 100% ethical plant-based lifestyle. You probably know that amino acids are related to protein, which naturally makes them important for bodybuilding, but glutamine may be the most important amino fatty acids for muscle growth and helping to repair muscle soreness. This is the most abundant amino acid found in human muscles and the vast majority of all naturally occurring glutamine is generated from within the muscles. So, clearly, muscle mass and glutamine are related. But why does this matter for bodybuilders? Glutamine and muscle tissue are in a symbiotic relationship. The muscles produce so much glutamine because it plays an essential role in muscle building, muscle pain, and repair. Whenever tissue is being formed, including muscle tissue resulting from the mass muscle building efforts you’re making, glutamine is part of that process. Babies actually produce a lot of glutamine because their bodies are undergoing such dramatic growth and glutamine supplements are actually used in the treatment of illnesses like HIV/AIDS to counteract muscle atrophy. Glutamine is a muscle builder, though your body does a lot of that work for you. However, when you’re undertaking an unusually rigorous program of muscle bulking as a bodybuilder, your body’s normal glutamine production may not be enough. That’s the basic logic behind the trend toward glutamine supplementation. 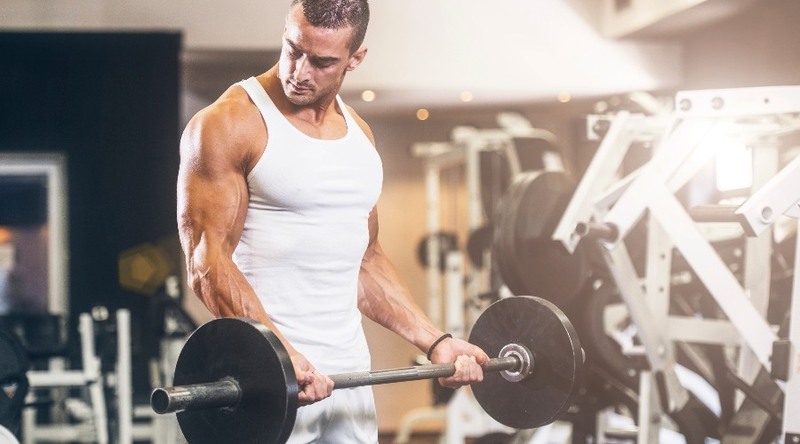 As with many of the other naturally occurring compounds, acids, and substances bodybuilders consume with supplements, the proportion of natural occurrence is theoretically not enough to keep pace with the extreme exercises you’re doing. Of course, that theory isn’t treated as gospel in all corners of the bodybuilding world, particularly by supplement-free vegan bodybuilders. Glutamine may be 100% naturally occurring, but taking it may not actually be the magic bullet that it seems like from the outside. The fact that it’s so widely used in the medical community is a good indicator that glutamine supplementation can be effective, but studies have shown that it doesn’t have a statistically significant effect on people undertaking a weight training program. There are arguments to be made against the relevance of studies like this one on the kind of training and dieting bodybuilders do, but to completely dismiss the evidence may be foolish, especially considering how expensive heavy-duty glutamine supplementation can be. Should You Take Glutamine Supplements? Though it’s produced in the muscles, there are actually a lot of plant-based dietary sources of glutamine. Everything from papaya to beets and cabbage provide a good natural source of glutamine, but supplementation is a more efficient means of absorbing large quantities of glutamine into the body. The answer to whether you should take glutamine supplements may depend on a few factors, including your faith in the efficacy of supplements in general. If you’re skeptical, there probably isn’t enough hard evidence out there to convince you to start taking it. However, if you’ve had good results with other supplements, you might want to give glutamine a shot. There are some medically accepted instances in which glutamine supplements can be helpful in the short term to make up for a natural deficiency. Any point at which your body is working overtime to repair a serious injury or heal an infection may be a good time to supplement glutamine. This will simply restore a normal level of glutamine in the body for muscle recovery since the available glutamine in your system is being used to heal those injuries or infections. Major stressful events can also cause your glutamine levels to dip. In this sense, conditional supplementation with glutamine is likely a good idea for anyone, especially bodybuilders. One note of caution: There is some evidence to suggest that excessive glutamine consumption can exacerbate seizure triggers in those who suffer from seizure disorders. If you have a history of seizures, don’t take glutamine supplements. There isn’t enough evidence to suggest that it’s useful enough to be worth the risk. Glutamine supplements are often included with protein powders and other supplement mixes. Options in this category include PharmaFreak Vegan Freak protein powder. You can also find glutamine included in specialized muscle recovery mixes like Vega Sport Recovery Accelerator. For sole glutamine supplementation, you can choose from vegan powders like NOW Sports L-Glutamine Powder or vegan capsules like Country Life L-Glutamine Caps. Though glutamine is—like other supplements related to muscle growth—best consumed both before and after a workout, it should also be taken throughout the day to ensure your body has a constant supply of the supplement. The theory behind this dosage schedule is that it provides the muscles with restorative support throughout the day to ensure you’re maximizing gains around the clock. To balance these two priorities, you can either take capsules throughout the day or use a protein or muscle recovery powder with glutamine before and after your workout and take capsules at other points in the day. Using glutamine powders on their own or mixed with other supplements is also a valid option.